Ideas about the social construction of identity are central to the work of many contemporary cultural theorists. The self is no longer seen as something simply innate and biologically determined but also as a reflection of society, a repository of cultural values. During the past decade feminist film theorists have used these ideas to examine the image of woman. They argue that it is constructed — “fabricated,” “pieced together,” and in every sense of the word “made-up” according to the rules and standards of society. Clothing is a densely coded visual system of signification that transmits psychological, sexual, and cultural messages. 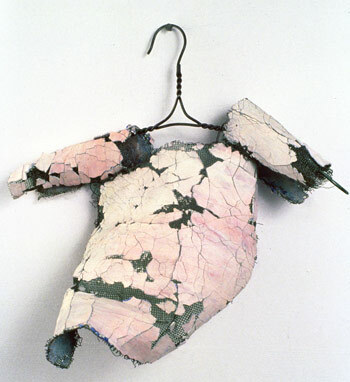 Therefore, many theorists have focused on the role clothing plays in the construction of female identity. They have attempted “to make its constructedness evident—to turn it inside out so the stitching shows.”1 Elise Siegel’s stitched and constructed garment-like sculptures provide a concrete aesthetic parallel to this inquiry. Siegel navigates this fine line between body and clothes in several corsets and bras. These foundation undergarments that are worn next to the body, mold and shape its image, become part of the body — a second skin. In a group of poignantly sutured bras, the straps read as bandages. It comes as no surprise that they were executed during the Dow Corning breast implant crisis of 1992. The corsets are alive with the anxious motion of the twisted and unraveling bandage-like strips from which they are constructed. Corset or viscera? Inside or out? Insides are out. Formally, the work in this exhibition derives from the artist’s previous, fully abstract sculpture, both in its anthropomorphizing references, its use of materials (pigmented modeling paste over wire mesh fabric) and its method of construction (cutting and sewing from patterns). She now employs these materials and techniques as a vehicle for ideas about contemporary culture. They also serve as the underpinnings for a broad range of expression and give the work a heightened emotional and psychological intensity. Through the language and imagery of clothing, Siegel achieves a graceful fusion of form and content. Ed Jane Gaines and Charlotte Herzog (New York: Routledge, 1990), 1. 2 Maureen Connor, “Icons at Large,” Artforum, vol.VIII, no.3 (November 1989), 26-28.